Indies First –– the grassroots movement started by author Sherman Alexie just three months ago –– was widely embraced in communities across the country this past Saturday, with customers turning out, sometimes in droves, to meet authors who had signed on to become booksellers for all or part of the day at their local independent bookstores. Prior to starting his rounds to Queen Anne Book Company, Secret Garden Books, The Elliott Bay Book Company, University Book Store, and Third Place Books, Alexie sat down with host Scott Simon on NPR’s Weekend Edition to discuss his day’s plans. “My career happened because the booksellers at independent bookstores hand-sold my book,” said Alexie, adding that the bookseller-reader relationship was crucial to gaining attention for his books. Customers heeded the call at bookstores across the country where Saturday’s events drew crowds, increased sales, and resulted in a heightened awareness of the benefits of doing what the campaign suggests ­­–– putting indies first. Phoenix Books, which has two locations in Vermont, extended its Indies First festivities to Sunday, hosting several local authors as booksellers, including Rusty DeWees, James Kochalka, Dr. Arnie Kozak, Dr. Dave Landers, Daniel Lusk, Angela Patten, Tracey Campbell Pearson, Robert Resnik, and James Tabor. Author Tracey Campbell Pearson had a list of recommendations for parents, many of whom left with stacks of children’s books. James Tabor stayed an hour past his scheduled shift and has already expressed excitement for next year’s event. Assistant manager Kari Meutsch said customers, who could be seen throughout the day chatting with authors and taking their book suggestions to heart, were thrilled. Phoenix plans to continue having important conversations with customers and local authors, making sure to let them know their options in terms of online shopping and self-publishing. 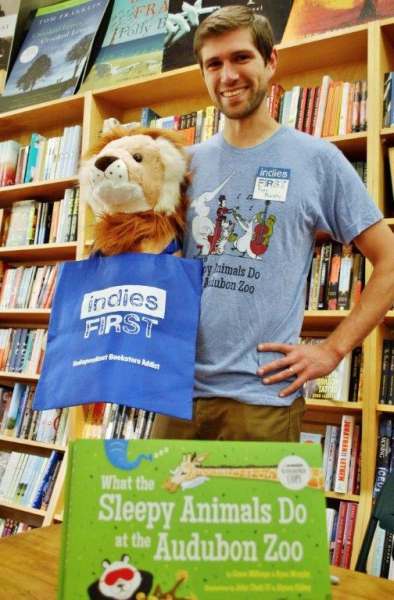 “Putting indies first is definitely a message that our booksellers understand and talk about openly, and warmly, with everyone who enters our stores,” said Meutsch. The store stocked some of both authors’ favorite books, which they talked up to customers, though shoppers seemed to be primarily interested in the authors’ own most recent titles. Island Books’ sales were up throughout the weekend, and “all in all, it was a terrific weekend and a good time was had by all,” said Crosby. At Milwaukee’s Boswell Book Company, sales were “up a lot on Saturday,” said owner Daniel Goldin. The store hosted 11 authors throughout the day, in two-hour shifts. “Every author had a lot of energy and seemed to have a lot of fun,” said Goldin. Boswell made bookmarks for each participating author that listed his or her titles. The bookmarks were placed throughout the store, inside the author’s own books, as well as in the books he or she was recommending. The store also created a display table that featured the authors’ titles, as well as their picks, and Goldin plans to keep it intact for the next several weeks for shoppers looking for holiday gift ideas. The authors’ picks were also featured in both the store newsletter and blog. Boswell’s author-booksellers included Lois Ehlert and Larry Watson, as well as a local sportscaster, local children’s authors and illustrators, and many authors that teach creative writing at local universities. Many of the authors had been booksellers in the past, and most of them knew each other, which gave the store “a lot of nice energy,” said Goldin. “Some of the authors got really into it,” he said, adding that Larry Watson was spotted handselling many different books, including fantasy titles. “A lot of people told us it was a good idea, and that they came in specifically to meet the authors,” said Goldin, adding that the store was extremely busy around noon. 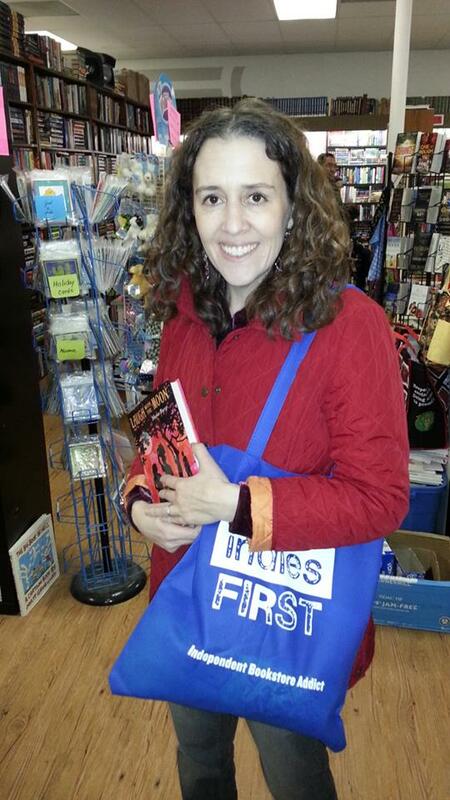 Lititz, Pennsylvania’s Aaron’s Books hosted A.S. King for Indies First. “We love A.S. King,” said store co-owner Sam Droke-Dickinson. “She’s a huge supporter of ours and has been since her first book.” King split her time between greeting people at the door and hanging out in the YA and middle grade sections. She made several recommendations to parents, kids, and grandparents. Later, King’s daughters and the owners’ son joined her in the kids’ section to make book suggestions. “There was definitely an awareness of shopping locally,” said Droke-Dickinson, adding that many were surprised to see an author working at the bookstore. 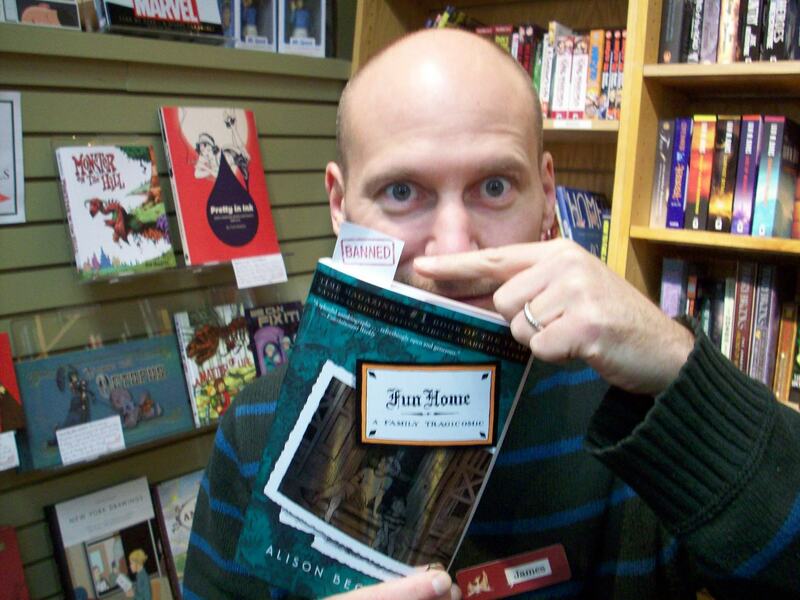 Aaron’s plans to use the Indies First promotional material in BookWeb’s DIY year-round, since it is in alignment with the shop local message the town promotes. 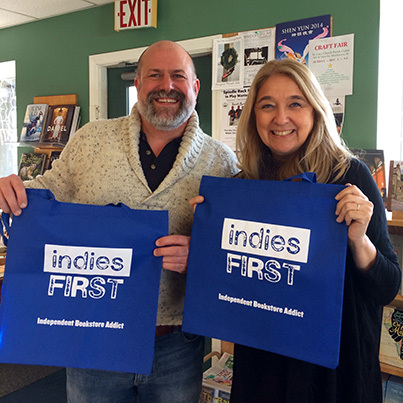 Author Lynn Plourde was a bookseller for a day at Apple Valley Books in Winthrop, Maine, and both the author and the store worked hard to promote Indies First, said owner Eric Robbins. “For us, it was a very good day,” he said. A few weeks prior to the event, Plourde provided the store with a list of books that she would be recommending, and Robbins made sure to have them all in stock. Plourde brought her own tent signs featuring her picks under the banner “Lynn Plourde recommends” and placed them around the store. Nearly everyone who came into Apple Valley seemed to be already aware of the event and its indie intentions, said Robbins, who added that he plans to strengthen the bookstore’s visibility on Facebook as well as its relations with local authors. Octavia Books welcomed nine authors, who handsold their own books as well as others they felt passionate about, throughout the day. Octavia provided each author with a copy of Sherman Alexie’s letter, which first challenged authors to become involved, so they were fully informed of the day’s mission. The authors wore nametags, and many greeted customers at the door, introducing themselves, and letting them know they were available to help shoppers. Octavia received a lot of attention from the media, said Lafitte, including a video shot in the store by a local news station featuring Lafiitte and co-owner Tom Lowenburg discussing the benefits of shopping indie. 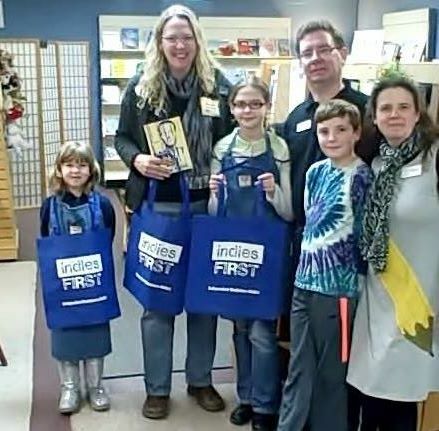 In Lee’s Summit, Missouri, Reader’s World welcomed nine authors, including Darlene Deluca, Dennis Young, and Trisha Leigh, and plenty of customers into the store for Indies First and Small Business Saturday. Assistant manager Jamie York created name tags for the authors, who, he said, jumped into their roles as guest booksellers with no prompting at all and had an excellent time chatting with customers and discussing books and reading. “It was like old hat. It seemed like they had been doing it all their lives,” said York. “I would hire every one of them.” Reader’s World, which just celebrated its first anniversary, doubled its sales compared to Small Business Saturday 2012. Customers seemed impressed that authors were in the store hand-selling books, said York, and many of the authors talked up the event on social media and urged their friends to come out in support. Many people said that they had waited for Saturday specifically so they could support small businesses on the special day. “It ended up being a great sales day,” said York. Auntie’s welcomed a range of authors, including some who are self-published. Among the day’s participants were Jess Walter, Shawn Vestal, Kenn Nesbitt, and Kelly Milner Halls. The authors were encouraged to promote books that they themselves enjoyed, and O’Harra said that many of the authors’ own books sold well throughout the day. Local authors Robert Julyan and David Ryan shared their knowledge about the popular hiking and camping spots in the nearby Sandia Mountains with customers, and Katie Lane spent time in the young readers section, where she suggested many fellow local authors to customers. “I had one customer who has only been in Albuquerque for about six months, so I hooked her up with Bob Julian to get to know New Mexico better,” said Bradley. The store also advertised a Tax Free Weekend bonus, in which the store paid the tax on all purchases for the entire weekend. Author T.C. Boyle spent two hours at Granada Books in downtown Santa Barbara, California, on Saturday. “It was a great event. He was a very gracious host,” said the store’s managing partner, Mark Zolezzi. 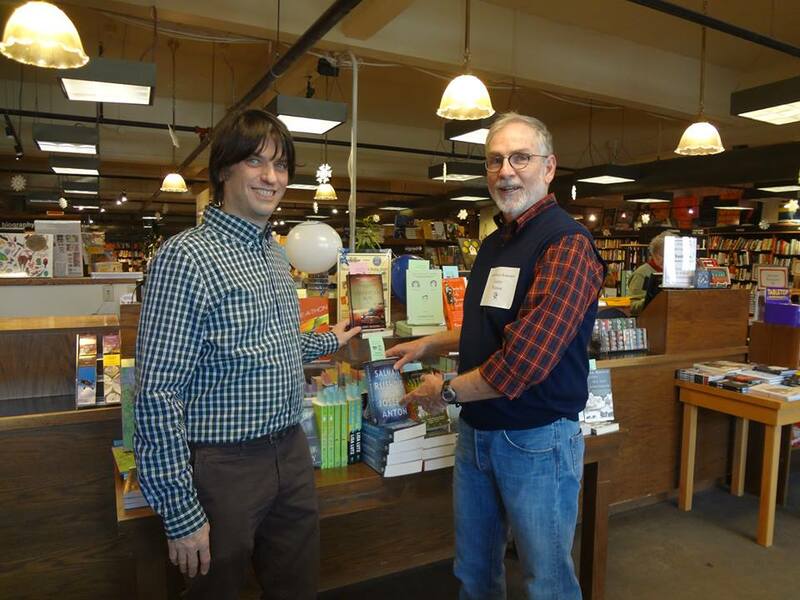 Boyle talked with customers, made book recommendations, and signed copies of his own titles. Granada, which opened in June, tallied its best sales day yet, chalking it up to a combination of Indies First, Small Business Saturday, and the holiday shopping season. Granada strives to foster the shopping local spirit in its community. “It was a great message to give to people at this time of year: don’t forget your local stores that aren’t chains, that are serving you year-round. It’s great to thank them by shopping there,” said Zolezzi. At The Book Spot in Round Rock, Texas, seven authors spent the day greeting customers at the bookstore, including Jeanette Larson, P.J. Hoover, and Shana Burg. Danny Woodfill, who owns the bookstore with his wife, Julie, was very pleased with the turnout. Author Garth Stein, who chronicled his adventures across northwest Washington for Shelf Awareness, made some personal discoveries during his visits to five bookstores in one day, including Liberty Bay Books in Poulsbo, Eagle Harbor Book Company on Bainbridge Island, The Elliott Bay Book Company in Seattle, Queen Anne Book Company in Seattle, and Third Place Books in Lake Forest Park. At Vroman’s, author Hector Tobar spent two hours in a green apron directing customers all over the store, which he knows well from his many visits to the Pasadena, California, store. “Building community and supporting independent bookstores were the reason we were all there,” Tobar wrote in a piece for the LA Times. Tobar sold several of his own books, complete with his signature, and took pride in directing customers to the books they were looking for, even if not his own. 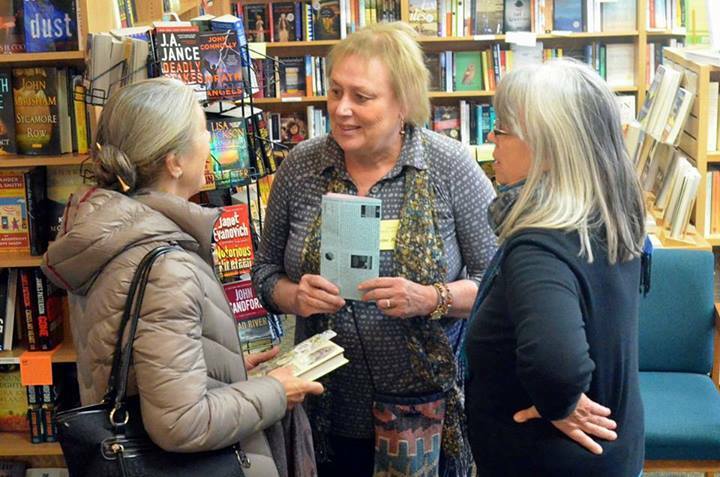 At the request of her local store, Malaprop’s Bookstore/Café in Asheville, North Carolina, author Denise Kiernan volunteered as a guest bookseller for Indies First and wrote an early piece for the Huffington Post to encourage readers to shop locally. “If you care about your community, you should care about shopping local. If you care about the economy, you should care about shopping local. If you care about books and the people who write them, you should care about shopping local. 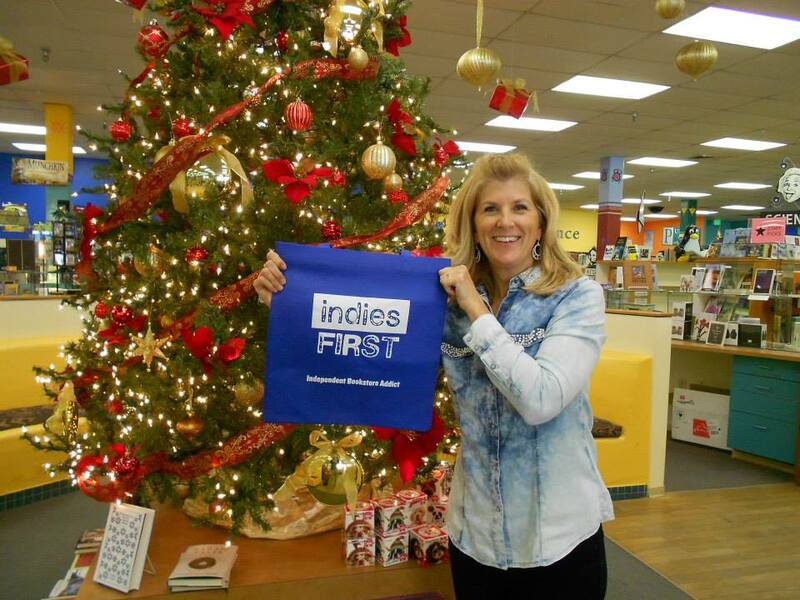 Each and every day we vote with our pocketbooks and the benefit of Indies First extends well beyond the pocketbooks of the author and the bookseller, and well beyond Small Business Saturday,” she wrote. Kiernan also encouraged fellow authors to both sign books at their favorite local bookstore and to direct fans to their local bookstores for purchases.